By Community Chickens on March 1, 2012 Visit Community's Website. Chicken eggs incubate for 21 days. To an anxious chicken addict, this can prove to be the hardest part of rearing chicks. Unfortunately, there’s not much we can do to rush Mother Nature, so I heed the lesson of patience and try to keep myself busy. Depending on the incubator you have, there are some daily routines that can keep you feeling like you’re “actively” waiting. Like I discussed in my last post, Part 3, if you are hand turning your eggs, this should be done three times a day. Water levels in your humidity source should also be checked and re-filled accordingly. As tempting as it is, try not to remove the lid too often, as the changes in temperature aren’t ideal. My favorite pastime while waiting for chicks to appear is candling. Candling is one of those amazing ways nature has made it possible for curious humans to look in on a growing chick with ease. With most other animals, scientific X-rays or ultrasounds are required to witness such miracles, but the amazing egg allows us to enter this embryonic world with only a flashlight and a dark room. 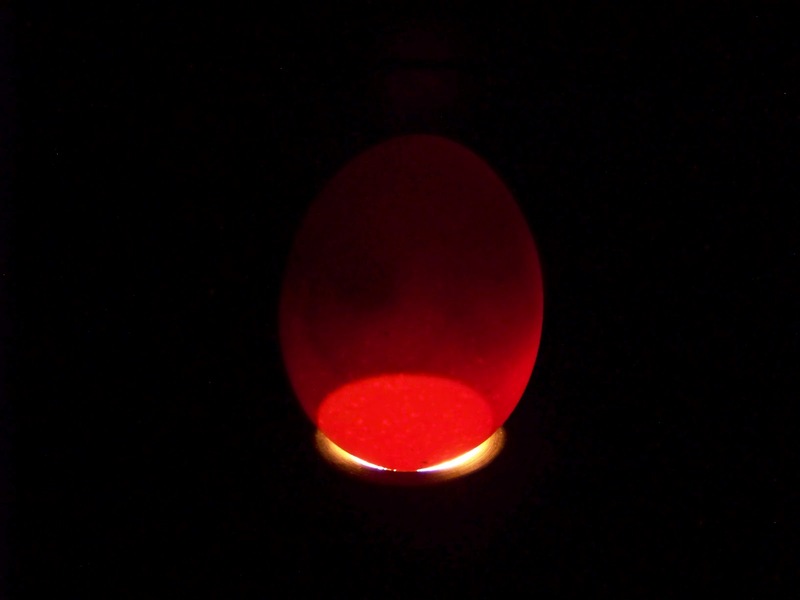 If you have small children who want to participate in the candling process but you’re wary about tiny hands balancing your precious eggs, consider ordering an Ovascope. It’s a great product by Brinsea that makes candling safe and easy. For more information on the Ovascope read my product review post The Brinsea Ovascope or visit Brinsea’s website. 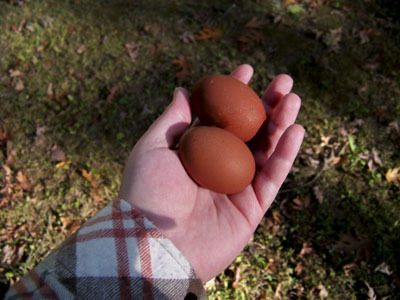 After about four days you can begin to candle your eggs to look for veins and the first formation of the heart. You can candle them before this, but there’s not a whole lot to see. Click here for a great link that shows photos of a chick developing each day for 21 days! As you can see, there’s not much to view by the end, as the chick is taking up most of the space. Some eggs are easier to see through than others. For example, French Black Copper Eggs are difficult to candle as their shell is very dark. If you can’t tell exactly what’s going on, look for consistency among the eggs to see that the chicks are all developing in a similar manner. 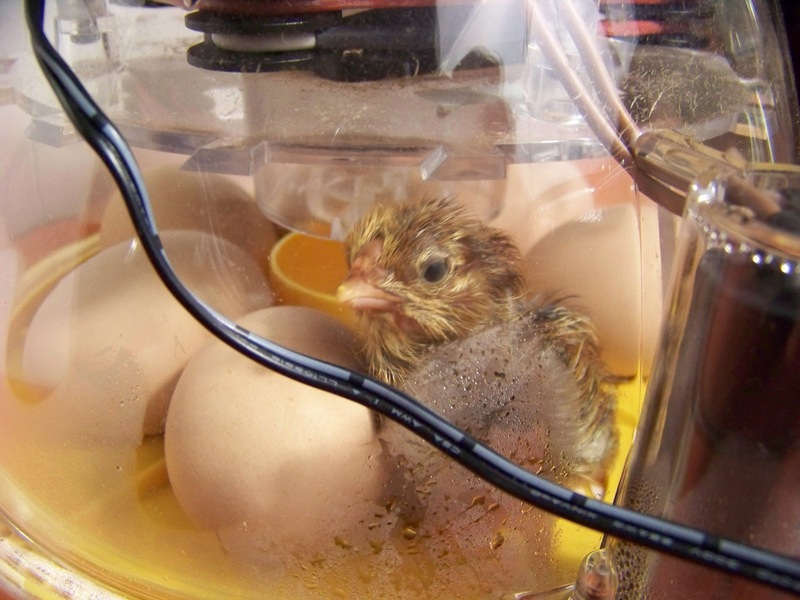 If you’re certain that an egg has stopped developing or is infertile, take it out of the incubator and discard. 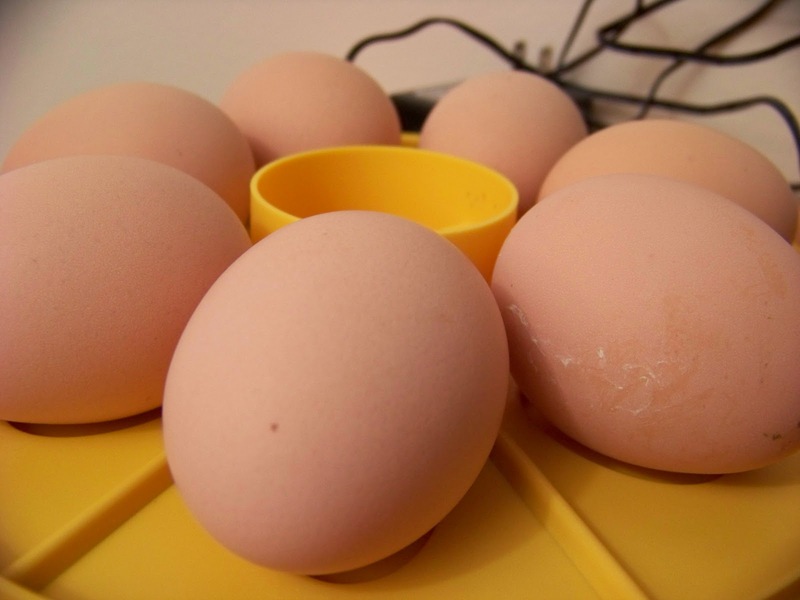 A dead egg can begin to go rancid and cause bacteria problems with your other chicks. I’ve even read that they can explode! Sure Hatch is a great site that helps identify problem eggs. Be sure to increase humidity levels a few days before hatch and stop rotating two to three days beforehand. Place small stones or a screen over your water source, as new born chicks can drown very easily. With our model, the Brinsea Mini Advanced, I take out the rotating disk and lay a piece of paper towel in the bottom of the incubator. This will help absorb any fluids when the chicks hatch, and help with clean up later on. It can also help prevent splay leg, as the paper has a bit more grip than slippery plastic. When chicks are born their leg bones are somewhat flexible. A firm place to stand at birth encourages correct leg development. Today is a good day to set up your brooding area as well. (More about that below). By now you should have your brooding area all set up and ready for chicks. 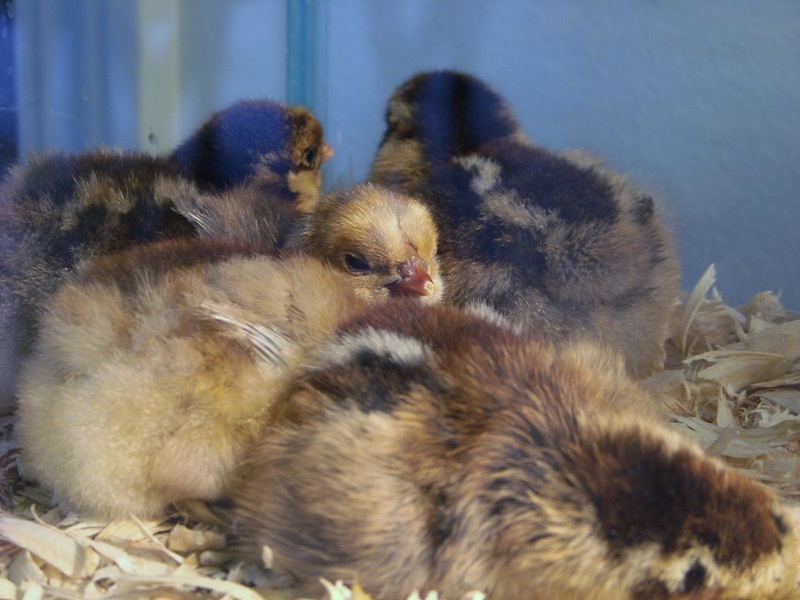 To read more about brooding chicks, read my blog post Raising Chicks. At your 21st day, your eggs will begin to wiggle and you’ll hear faint peeping through the shell. Then you’ll go make yourself a sandwich and you’ll come back and there will be the first pip hole. 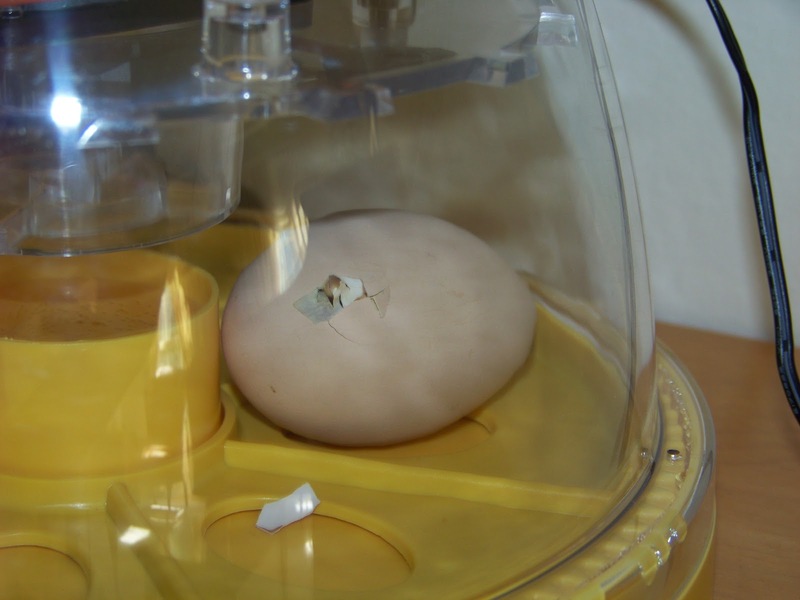 The egg will probably stay in this state for several hours. Hatching is exhausting stuff for chicks, and in my experience, it can take several hours for a chick to break completely through. Once your chick hatches, it will be soaked to the bone and wobbly. It will go through episodes of frantic stomping and thrashing about, crashing into the other unhatched eggs or its brothers and sisters, then into periods of immediate exhaustion and sleep. I carefully take out the broken shell pieces, but leave the chicks in the incubator until they have dried and fluffed out. This can sometimes take a whole day. Chicks don’t need to eat or drink for the first 48 hours of their life. They still have the yolk of the egg supporting them, so don’t worry that they’ll be getting hungry or thirsty. Once dry, they can be moved to their brooder box with heat lamp set at 95 degrees. 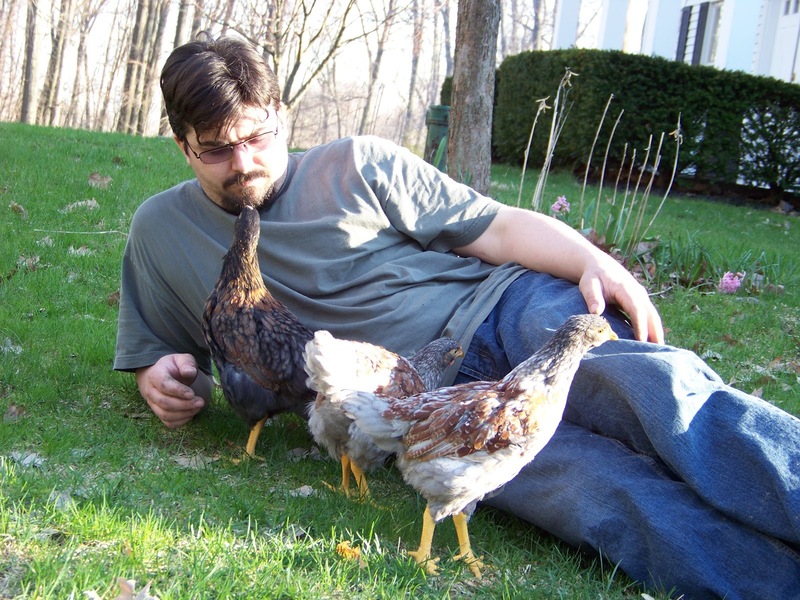 Be sure to talk to your chicks and make yourself visible, as imprinting starts at birth. I’ve definitely noticed a difference in personality from chicks that I’ve raised from an egg. They are friendlier and more eager to follow you. 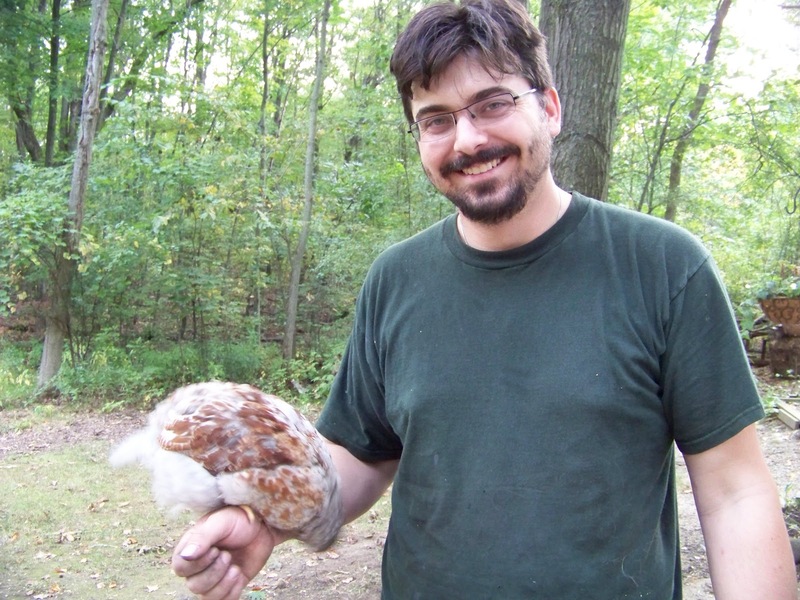 In fact, we have a very large rooster that sort of took to my husband Zach from the start. As a chick, Zach taught him to jump on his finger, and then, as he got older, to jump on his arm. Now he’s grown into a hefty boy and loves to sit on Zach’s shoulder like a pirate and his parrot, while he does the daily chores. The problem is, he’s not particular about who’s shoulder he lands on, and sometimes his aim is a bit off, so it’s a bit of a surprise when he decides to leap off the ground and land on my head! incubator for I now find hatching eggs would be this fun and amazing to do. Keep this up! Awesome post on candling and hatching day. 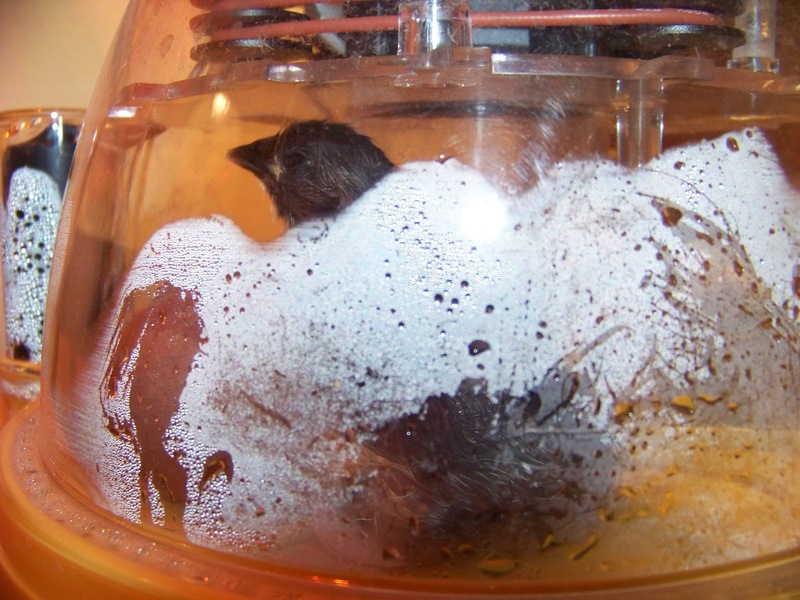 It is necessary to check periodically the incubator for humidity source or the system working condition for the best result of hatching.